A warming climate could lead to more deadly hurricanes. Flooding from Hurricane Harvey in Port Arthur, Texas on August 31, 2017. Source: Wikipedia. One year ago, Hurricane Harvey dumped record rainfall on southeastern Texas. Some areas received more than 40 inches of rain. According to new research, the heavy rainfall was a direct result of unusually warm temperatures in the Gulf of Mexico. That’s Kevin Trenberth of the National Center for Atmospheric Research. He says that during a hurricane, warm ocean water evaporates into the atmosphere, where its energy fuels the storm’s swirling winds. And, the evaporated water creates moisture that then condenses into rain. 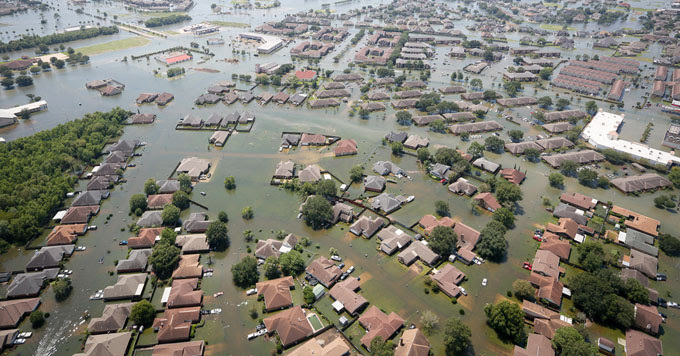 Trenberth’s research on Hurricane Harvey found that the amount of heat energy released from the ocean matched the energy released as the hurricane converted that moisture into rainfall. Trenberth says that as oceans continue to warm, they will provide even more fuel for powerful – and devastating – storms.